At the time of Captain Cook’s arrival (1778-1779), the Hawaiian Islands were divided into four chiefdoms: (1) the island of Hawaiʻi under the rule of Kalaniʻōpuʻu, who also had possession of the Hāna district of east Maui; (2) Maui (except the Hāna district,) Molokaʻi, Lānaʻi and Kahoʻolawe, ruled by Kahekili; (3) Oʻahu, under the rule of Kahahana; and (4) Kauaʻi and Niʻihau, Kamakahelei was ruler. In this company there were eight famous warriors, who seemed to think themselves invulnerable: Pupuka, Makaʻioulu, Puakea, Pinau, Kalaeone, Pahua, Kauhi and Kapukoa. They had often faced danger, and returned chanting victory. With the coming of morning light they found themselves not far from the old temple, which had been used for ages for most solemn royal ceremonies, a part of which was often the sacrifice of human beings, and here, aided by their gods, they thought to inflict such injuries upon the Maui men as would make their names remembered in the Maui households. While Kahekili and his Maui army were camped near the heiau at ʻApuakehau, they were suddenly attacked by the eight of Oʻahu. Without authorization from Kahahana, into these hundreds the eight boldly charged. The conflict was hand to hand, and in that respect was favorable to the eight men well-skilled in the use of spear and javelin. Side by side, striking and smiting all before them, the little band forced its way into the heart of the body of its foes. Wave upon wave of men from Maui beat against the eight, but each time the wave was shattered and scattered and destroyed. Large numbers were killed while the eight still fought side by side apparently uninjured. 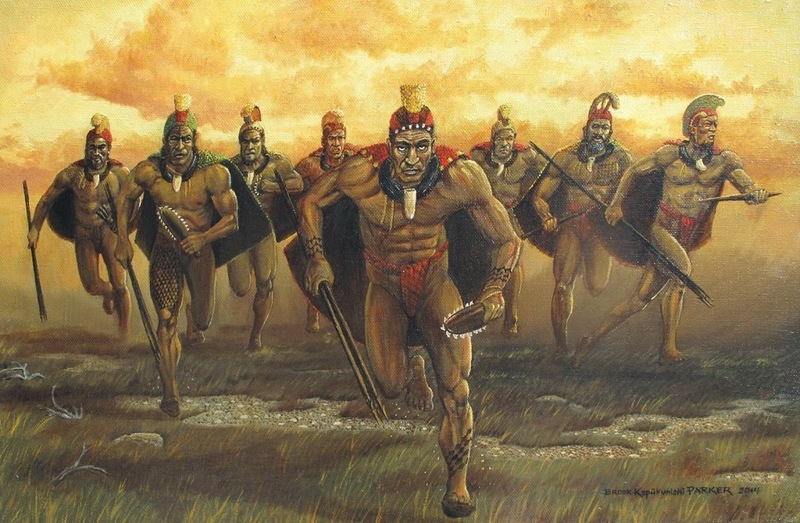 Surrounded, they were able to escape at Kawehewehe, killing dozens of their adversaries. Kahekili and his eldest son and heir-apparent, Kalanikūpule, conquered Kahahana, adding Oʻahu under his control. (Kahekili’s son, Kalanikūpule, inherited his chiefdom; Oʻahu was later lost to Kamehameha in the Battle of Nuʻuanu (1795.)) The image shows the Oʻahu Eight, drawn by Brook Kapukuniahi Parker.